Jeff Currier was born in Massachusetts and grew up fly fishing throughout New England. Now Jeff resides in Victor, Idaho with his wife Yvonne where he bases his globe-trotting career in fly fishing. He is an active member of the R.L. Winston Rod Co Professional Advisory Team as well as Simms, Scientific Anglers, Costa Sunglasses, Yeti, Bauer Reels and Kate’s Real Foods. Jeff is a “Fishing Ambassador” for Yellow Dog Flyfishing Adventures hosting exotic trips and exploring new destinations. Jeff is a fly fishing lecturer and well known fish artist. He has taught the skills of fly fishing, guided fly fishers throughout Wyoming and Yellowstone National Park and escorted fly fishers throughout six continents for many of the worlds greatest game fish. Jeff has learned a lot by participating in the World Fly Fishing Championships including the Polish and Spanish nymphing techniques and English lake techniques. Listen in as Jeff shares all that he's learned from European fly fishers. Jeff Currier has just returned from Egypt and his second adventure in search of the exotic Nile Perch. Join Jeff to learn about what it takes to figure out a fish that is seldom caught on a fly. Jeff Currier explores India's rivers for the exotic Mahseer. It's a huge fish that is seldom caught on the fly but Jeff was determined to do so and did. Learn from Jeff the process he uses to figure what makes a fish tick. 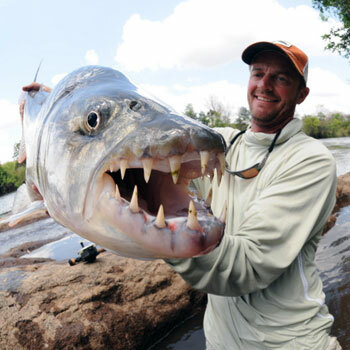 Jeff Currier loves adventure fly fishing and is back at it again chasing tigerfish in Tanzania. Listen in to learn about fishing for this exotic species. Jeff Currier has been at it again. Exploring exotic parts of the world in search of fly fishing treasures. Join us as Jeff talks about his travels to Brazil, Venezuela and Panama in search of peacock bass, piranha, arowana, jacunda and monster catfish. Jeff Currier has been on another great adventure - this time in Bolivia for Golden Dorado. Dorado have voracious teeth and put up an incredible fight. Listen in to find out how Jeff did and whether he landed his trophy fish. Jeff Currier, a world traveling fly fisher, went to Sudan to fly fish. Where did he go? What did he fish for? What was his adventure like? Listen in and find out as we go on another Currier adventure. Jeff Currier’s pursuit of the yellow permit, 10 pound plus bonefish and the Picasso triggerfish puts him on the other side of the world on St. Brandon’s Atoll in the Indian Ocean. Who else would endure a 26-hour boat ride after 40 hours of flight travel to add a few more fish to his bucket list. Join us to learn about another “Monsoon” Currier adventure. Jeff is a well sought after expert for television appearing on Fishing the West, Fly Fishing the World, In Search of Fly Water, Reel Adventures, Fly Fish TV and Fly Fish America. He has also been a six time guest on Ask About Fly Fishing Internet Radio speaking on European Fly Fishing, Nile Perch in Egypt, Mahseer in India, Tigerfish in Africa, Fly Fishing for Peacock Bass in the Amazon and Golden Dorado in Bolivia. Jeff was also a featured angler in the popular fly fishing movies Turning Points North, Carpland, Waypoints, Connect and Soulfish 2. Jeff’s articles, photographs and artwork have graced the pages of magazines, catalogs, brochures and books. Jeff is the acclaimed author of Currier’s Quick and Easy Guide to Saltwater Fly Fishing and Currier’s Quick and Easy Guide to Warmwater Fly Fishing guide books. These books have become the standard introductions to saltwater and warmwater fly fishing. When not fishing or writing, Jeff is usually found working on one of his favorite hobbies, painting fish. His fish art decorates T-Shirts, fly reels, coffee mugs, books, magazines and his original watercolors are always in high demand. Although Jeff spends much of his time fly fishing for trout, he is a walking encyclopedia of fly fishing for species worldwide. He is constantly traveling and developing techniques for catching the most exotic fish imaginable in places where even the most avid adventurer refuses to go. This IGFA World Record holder and National Fresh Water Fishing Hall of Fame Record holder has fished in over fifty-five countries and caught over 325 species of fish on the fly! Jeff has won numerous Fly Casting Competitions, the Jackson Hole One Fly and competed throughout the world in fly fishing. Jeff’s most recognized accomplishment was leading Team USA to its first ever top-ten finish in the World Flyfishing Championships in Jaca, Spain. During the competition Jeff managed to fool fish on every venue and placed third in the individual standings, becoming the first American ever to take home a medal in the thirty-year history of the Championships. When not fishing, Jeff can be found lecturing throughout the United States and Canada on nearly every aspect of fly fishing. He demonstrates fly casting, teaches seminars on the basics to the advanced skills of fly fishing and presents many fly fishing destination programs ranging from his home waters in the Rockies to the most remote corners of the globe. Some of his shows take you to distant waters and a world of fly fishing that many don’t know exists and will leave you in awe that such creatures can be enticed to eat a fly! Jeff brings a sense of humor, enthusiasm, approachability and over forty years of fly fishing to wherever he goes. You can follow Jeff’s global fly fishing adventures, exploits, tips, advice, photography and story-telling on his expanding blog and informative website.